In the last days of the Obama administration, on December 20, 2016, the White House published a white paper (no pun intended) titled “Artificial Intelligence, Automation, and the Economy.” Listed among the contributors were John Holdren, the President’s science advisor, as well as world-class experts in economics, technology, and domestic policy. This paper was a big deal. My friend Granville Sewell published Christianity for Doubters in 2016. It remains available with Amazon here. YouTube is a racket: industrial copyright theft on a planet-wide scale. They get Gladys Scroggins of 27b Elm Street to do most of the active thievery – posting, say, her favorite Michael Jackson video – and then they become one of the biggest corporate behemoths in history by selling advertising off her theft, and tossing the occasional dime Gladys’ way. If you raise an objection to anything they’re doing, you get 47 emails from fellows with different first names – “Bob”, “Dave”, “Nigel”, “Kelli-Su”, “Miguel”, “Rajiv”, “LaShon’dra”, “Bud” – all reciting the exact same boilerplate screw-you response. Why, it’s almost like being made to sit at the back of the cyber-bus or use a separate de-monetized drinking fountain… Don’t like it? Well, you can go to a rock-ribbed conservative like, say, Senator Mike Lee of Utah. But Google/YouTube recently moved into his state and — surprise! — he now seems disinclined to rock that particular boat. Tucker Carlson interviewed him, and some edgy Internet types lifted the interview and posted it to YouTube, billing Senator Lee as “Google’s Number One bootlicker” — and then complained that Google/YouTube had “shadow banned” them so they’d only just realized that Google/YouTube were preventing them cleaning up with Google/YouTube ad revenue by posting somebody else’s content on Google/YouTube in order to trash Google/YouTube. That right there is the Internet in a nutshell. On Friday, October 27, 2017, we laid to rest my Dad at a graveside service (see previous post). My Dad was a WWII vet, and men from the local VFW showed up to present my Mom with a flag (which initially was draped over the casket), as well as to give a gun salute and play Taps. These military honors were deeply moving. 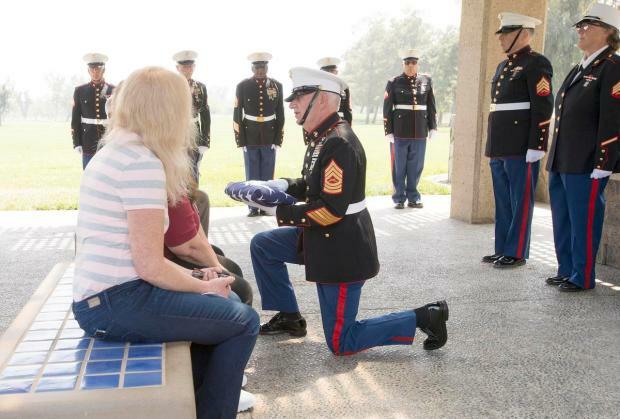 But what struck me most was when the retired officer who presented my Mom with the flag, after he had properly folded it, “took a knee.” In other words, he kneeled in front of my Mom to present her with the flag for my Dad’s honorable service to our nation. After he kneeled to give my Mom the flag, I couldn’t help but think of the NFL. I thought how shameful it was that the NFL has allowed players to continue to disrespect our anthem, flag, and nation by kneeling. And I also thought how doubly shameful it was that funerals of our vets, where flags are rightly presented to grieving family from a kneeling position, now call into contrast the dishonorable behavior of the NFL. I now make a point of not only refusing to watch NFL games or highlights, but also changing the channel when anything involving the NFL is on TV. UPDATE 5/23/18: Looks like the NFL ownership and administration are now going to require players and personnel on the field to stand (see here). It awaits to be seen if the players will abide by this. My Mom called me from Arizona last night to tell me that my Dad had died that afternoon as he was taking a nap. He was 94, and they had been married 59 years. Although he had been vigorous until a few months ago, and was clear in the head to the end, recently he had become frail. I was not surprised to hear the news, but it still hit me, and especially my Mom, hard. My parents had hoped in the next month or two to get up here to Iowa, where my wife and I and their only grandkids live (I’m an only child), but it will now only be Mom making the move. The picture above shows my Dad when he was 86, with grandkids Chloe and Will. Will’s twin brother John is severely autistic, and it was hard on the spur of the moment to find a good photo of him with “Opa,” as my Dad was known to the grandkids (I’ll keep looking). I only mentioned my Dad’s passing to a handful of people, but it seems that word has been getting around among friends and colleagues, and people are being so very kind. I therefore wanted to put up something about him when people express their good wishes and perhaps want to know something of his life. As it is, it’s not clear when we will be able to have a proper funeral service for him. (Update: A graveside service was held Friday, October 27th at Oakwood Cemetery in Pella, Iowa.) My parents had retired to Arizona back in 1992 (Green Valley, south of Tucson). Their move to Arizona was part of a “migration” of friends from the Chicago area who decided to retire down in Arizona, but most of those friends are now dead. Mom didn’t want Dad buried in Tucson, nor at a veteran’s cemetery in Phoenix, so his body is being moved to Iowa while my Mom tries to sort things out in Arizona before getting up here. William Joseph Dembski (July 1, 1923 — October 17, 2017) had a long and good life. To say that he had a good life, however, is to understand that a good life is one that ends well, not necessarily one that starts out well. My Dad was the fourth child, in as many years, of Mary and Boleslav Dembski. My grandmother suffered severe post-partum depression after delivering my Dad. He was the unfavored child, and it didn’t help that he, of the four siblings, most looked like his father, who was a philanderer, and left the family in 1930 to claim his inheritance in Poland.